Paint, sketch, draw, and illustrate with ease. A stunning collection of over 100 handcrafted, dual-texture brushes. Keep your favorite brushes within reach. Erase using any brush in your collection. A familiar way to choose and manage your colors. Pick out and paint with colors from your images. Fill similarly-colored areas with colors of your choice. Fill areas with a gradual blend of multiple colors. An easier way to create awesome pixel art. Full support for all graphics tablets compatible with macOS. A cutting-edge, Metal-based Painting Engine powers painting in Pixelmator Pro. Paint, draw, sketch, and illustrate. Use the Paint Tool to paint anything you like. Thanks to the GPU-based, 16-bit Painting Engine in Pixelmator Pro, painting feels smooth and responsive, which brings an incredibly natural experience. And with a gorgeous collection of handcrafted brushes to choose from, you can easily create beautiful digital or traditional paintings, sketch, draw, illustrate, or just paint on your photos. The Painting Engine in Pixelmator Pro was designed and built for maximum quality and maximum speed. So painting is incredibly responsive without sacrificing quality. The brand new Zoom Engine in Pixelmator Pro delivers fast and fluid zooming and panning. Which means the entire painting experience, including navigating around your image, feels super smooth. When painting, you can quickly change the Size and Softness of the Paint Tool using a handy shortcut menu — simply Control-click the canvas to see it. Use layers to nondestructively build up your paintings piece by piece. The painting tools aren’t just great for painting. You can also use them to retouch your photos, edit layer masks, or even brush precise selections in Quick Mask Mode. Pixelmator Pro features intuitive and easy-to-remember keyboard shortcuts for all the settings and tools you use most often while painting. A new cursor design in Pixelmator Pro tells you more about the Softness of a brush. When you increase Softness, a dashed outline shows you exactly where the soft edge starts. The Paint Tool lets you paint with over 20 Blending Modes. So you can blend your brushstrokes with your image in a range of distinctive ways, create dazzling special effects, or experiment with different styles. 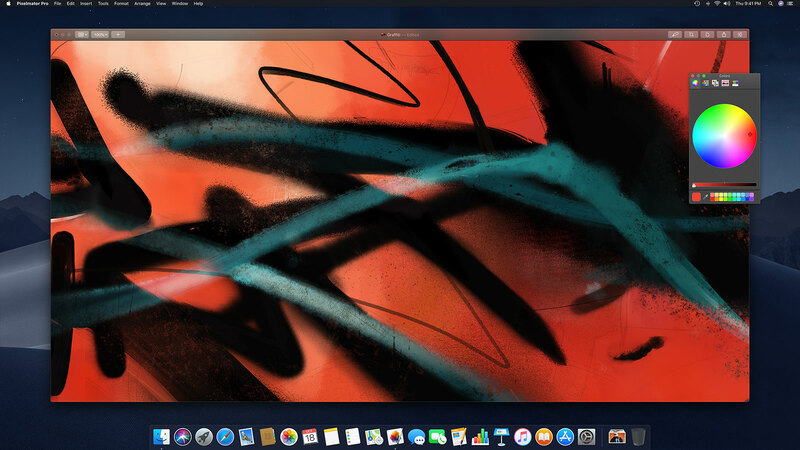 Pixelmator Pro includes a stunning collection of over 100 handcrafted, dual texture brushes with advanced brush dynamics and our Dynamic Paint Blending technology. So you can choose from a dazzling array of gorgeous paintbrushes, watercolors, markers, pencils, crayons, basic brushes, and more. Dual Texture brushes are composed from two separate textures — one for the brush shape and and one for the grain — so you can paint with deeper, more expressive brushstrokes. Thanks to shape, grain, scatter, stroke, speed, and other advanced brush dynamics, brushes respond precisely to the speed and direction of your brushstrokes. Customize any brush down to the very last detail. Or use your own images as textures to create fully customizable dual texture brushes from scratch. Our Dynamic Paint Blending technology simulates the wet paint effect by naturally blending together paint from each individual brushstroke, bringing true-to-life paint blending to the digital canvas. Share any brush or brush collection with anyone you want. Sharing is as simple as dragging and dropping brushes from or into Pixelmator Pro. Save your favorite brushes and quickly switch between them as you paint without having to browse through your entire collection. And when you switch to the Erase Tool, the favorites automatically switch to your favorite erasers. Use the Erase Tool to erase parts of your image. 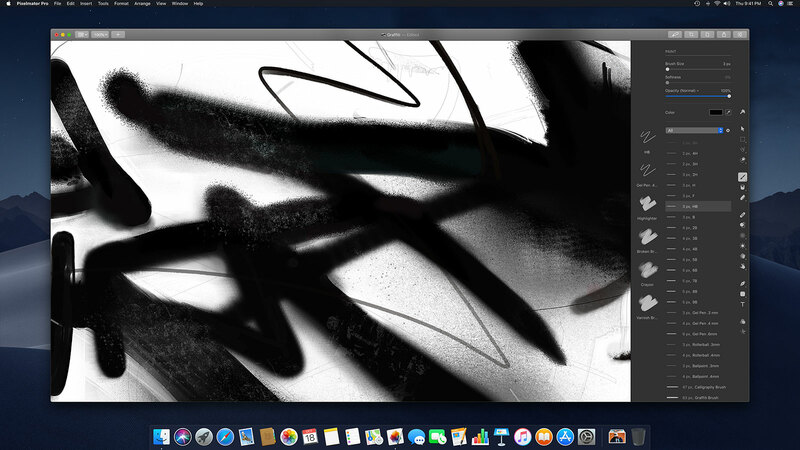 The great thing about the Erase Tool in Pixelmator Pro is that it works with any brush in your collection — from the basic round brushes, to inks, crayons, and even watercolors. 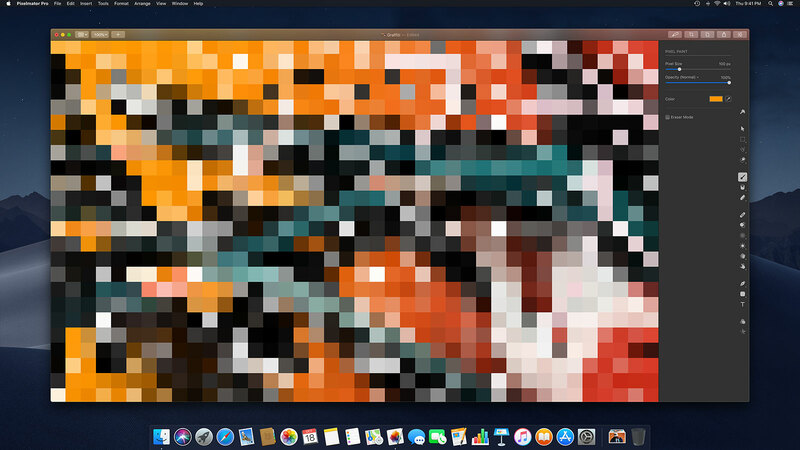 Pixelmator Pro uses the standard macOS color picker — the Colors window. It’s the same window you find in native Mac apps like Pages and Keynote, so you already know how it works. And all the colors you save in Pixelmator Pro are there for you to use in your other apps. Use the magnifying Color Picker to quickly pick specific colors from your images. You can even use it as you paint — just hold down the Option key and click any color in your image to choose it. Flood your images with color. Using the Color Fill Tool, you can quickly fill similarly colored areas or even entire layers with a color of your choice. Thanks to the Smooth Edges feature, which naturally smooths the edges of the areas you fill, you can easily recolor parts of your photos, or change the colors in drawings and paintings with just a few clicks. The Gradient Fill Tool lets you quickly fill precise areas or entire images with a gradual blend of colors. You can create linear, radial, and angled gradients between as many colors as you want and customize the transitions between them. And you can even use the Gradient Fill Tool with selections and layer masks to create gradual transitions between images and objects in your compositions. Build up your artworks pixel by pixel. Use the Pixel Tool to create awesome pixel art. It automatically lines up each pixel you place on the canvas, no matter how big or small the pixels are. Which makes it much easier to create pixel art that is, simply put, pixel perfect. Pixelmator Pro features full support for graphics tablets, including support for pressure sensitivity and tilt. This gives you fine-grained control over how brushes change according to the way you apply your pen to your graphics tablet. 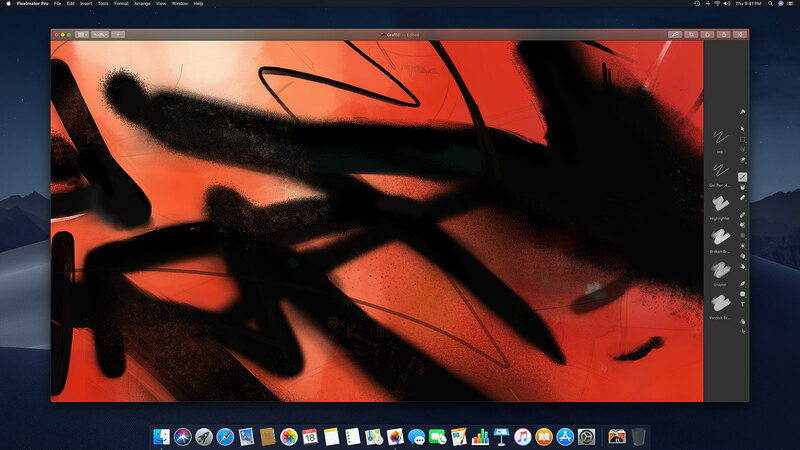 And if your graphics tablet is compatible with macOS, it’s compatible with Pixelmator Pro. So you can paint, sketch, and draw just like you would on paper or a real-life canvas. 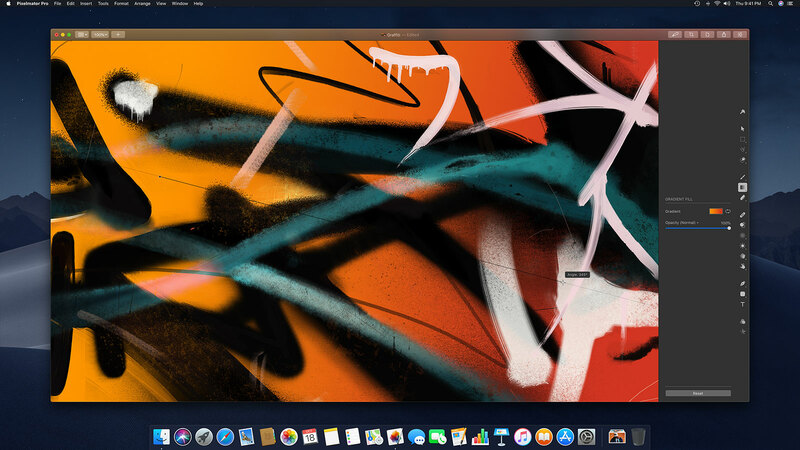 The incredibly advanced Painting Engine — powered by the graphics processor in your Mac — is the foundation of painting in Pixelmator Pro. Engineered from the ground up to take full advantage of powerful macOS technologies like Metal 2, Core Image, and OpenGL, the Painting Engine delivers blazing fast performance, a smooth and fluid experience, and stunning color depth with 16-bit painting, even in 8-bit images. Using Metal 2, Pixelmator Pro harnesses the full power of the graphics processor in your Mac. Core Image improves the color detail and quality of every painting tool. 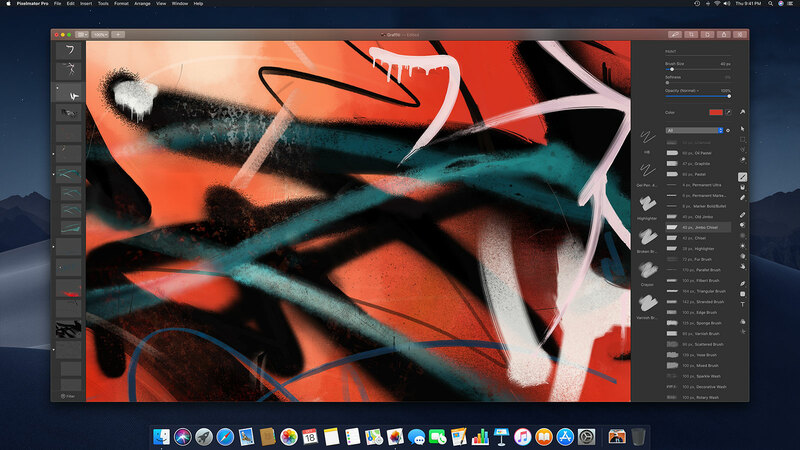 With OpenGL, Pixelmator Pro brings blazing fast, hardware-accelerated painting.